Before I started my radiation therapy I began a regime of applying Nature’s Aid to the area that was to be involved. The scar from surgery is almost invisible and there was not even a hint of redness, let alone a burn, from the radiation treatment. I have bought this gel for a few people who have told me that they will be receiving radiation treatments and have had only positive feedback. I just wanted to send a quick email to tell you how much your product has helped some people around me. I was in a tiny health food store in Kitchener Ontario when I came cross your product. I had not heard or seen it prior to my visit that day. When I seen your product, it came to mind a girl I work with who’s sister is having chemo treatment to remove her stage 2 Breast Cancer. Within 2 days of my friends sister trying your product, she was sending me back for more. It was the ONLY product she was able to use during her chemo treatments on her burnt scalp that did not hurt her and in fact helped it feel so much better. After she had great success with it, she used it on a rash her son has had on his arm for years that doctors had to been able to help with any prescription and within 2 days he started to heal as well. She was so impressed with your product, she took in the bottle I had given her into her oncologist at her following appointment. Her oncologist is very interested in your product as well she is looking into recommending it to her other patients. I have also found your product wonderful for the dry patch I get on my scalp from wearing a constant ponytail, and I also use it on acne I get on my cheeks occasionally. I have had my sister who is a nutritionist try this product so she can recommend it to her clients also. Since then, I seem to have become the ‘supplier’ of this at work since good news travel fast and I get nothing but amazing stories from everyone who tries it! Thank you so much and I look forward to seeing it soon in my other favorite health food stores. I LOVE Nature’s Aid! I am being treated for cancer and had some surgery prior and it was the only thing that cured my peeling skin. Thank you very much. 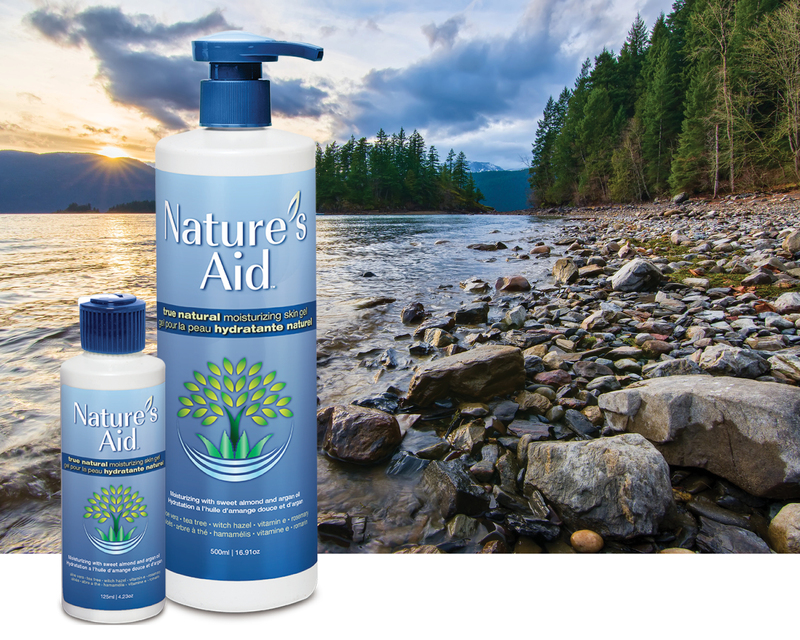 I have just got back from Canada, and whilst there purchased some Natures Aid skin gel – I am very impressed!! Do you have any outlets in the UK where I could purchase more? I have been an eczema sufferer since childhood; four years ago, I had a severe outbreak. I was prescribed countless creams and ointments containing cortisones and steroids, however none of them were able to provide any relief. About four months ago, I was introduced to your product. What a difference! All natural, soothing, and it works! Not only does it provide the relief I have been looking for, it has also repaired many areas of my skin that I thought would be permanently damaged. Thank you, Nature’s Aid! I’m a Registered Nurse in Sudbury. I’ve been using your product for ~5 yrs. (recommended by one of my sister’s friends)…& I absolutely LOVE it…for just about anything related to the largest human bodily organ! I had obtained some of your pamphlets during one of my Nature’s Aid purchases from Paris Natural Foods to hand out to family, friends, & most regularly to my patients with any form of dermatological problem. P.S. THANK YOU WHOLEHEARTEDLY FOR CREATING SUCH A MAGNIFICENT NATURAL PRODUCT…MUCH APPRECIATED! Before I started my radiation therapy I began a regime of applying Nature’s Aid to the area that was to be involved. The scar from surgery is almost invisible and there was not even a hint of redness, let alone a burn, from the radiation treatment. I have bought this gel for a few people who have told me that they will be receiving radiation treatments and have had only positive feedback. I “Love, Love, Love” this product. Since it was first introduced to me about 5 years ago, I have not been without any. I have recommended this product to everyone I know and they too “Love” it!